Exposition Brand Lemon Crate Label, Johnston Fruit Co., Santa Barbara, California. Image of a Diploma awarded for Grand Prize at the Alaska Yukon Pacific Exposition. 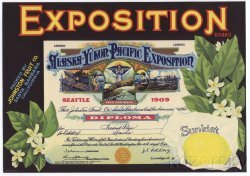 Exposition Brand Lemon Crate Label. Vintage label from Johnston Fruit Co., Santa Barbara, California. This original, mint 1940s label measures 8.75x12.25 inches. Image of a Diploma awarded for Grand Prize at the Alaska Yukon Pacific Exposition.